The day was beautiful and sunny, with the Spring flowers beginning to blossom across cities as I set out to travel to West Yorkshire, namely to the city of Bradford. The Cedar Court Hotel was an astounding venue that was both inviting and contemporary, which sparked excitement for the day ahead. Not only was I impressed by the red carpet and chairs with beautifully lit rooms, I was greeted warmly by many Ophthalmologists and other healthcare professionals that I had never met prior to this meeting. The registration was quick and a demonstration was given in regards to the technical IT devices that I was to utilise later in the afternoon. It was very organised and everything was well structured. 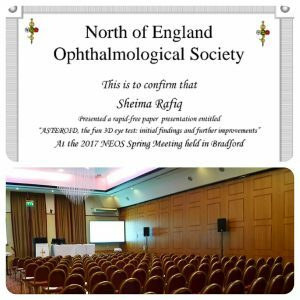 Tea, coffee and refreshments were available around 9:00 with a chance to peruse the exhibitor stands and familiarise oneself with the new developments in the world of Ophthalmology. As the afternoon approached, I got ready for my upcoming presentation and just a little after 13:00 I arose to give the talk on ASTEROID at the stage behind a podium. My aim was to create awareness of ASTEROID and inform professionals of our current progress. I had 5 minutes to deliver (but what felt like whizzing) through my seven-slide presentation with an opportunity to answer questions for a minute, thereafter. I informed members of our progress with the testing – having tested over 900 children now! Excitedly, I outlined the many advantages of ASTEROID as a 3D eye test over current tests and mentioned our plans to further improve ASTEROID and implement various techniques. I had fulfilled my aim and received a pleasant round of applause with positive feedback in regards to my presentation. Many people approached me over lunch and the afternoon tea break to discuss ASTEROID. It was wonderful for people to express keen interest in this fun 3D eye test and envision its success, potential and efficacy. Following several other fascinating talks, the day rounded off around 17:30 as I made my way back to the North East – Newcastle. 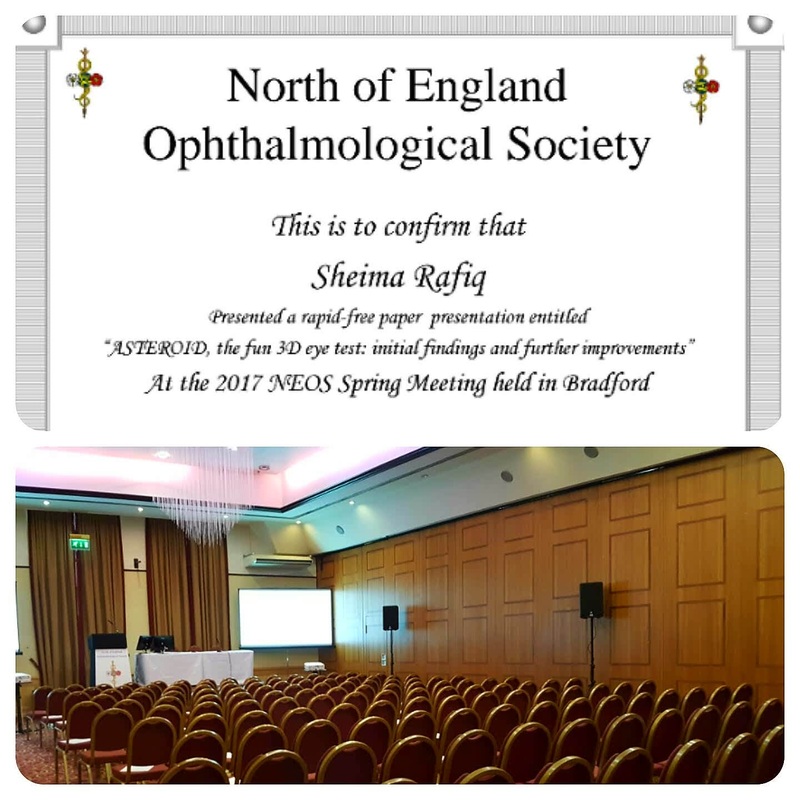 I thank the North of England Ophthalmological Society for accepting our abstract and providing ASTEROID with the opportunity to present during the free paper segment. It was a great experience and a platform to network and showcase this promising test.